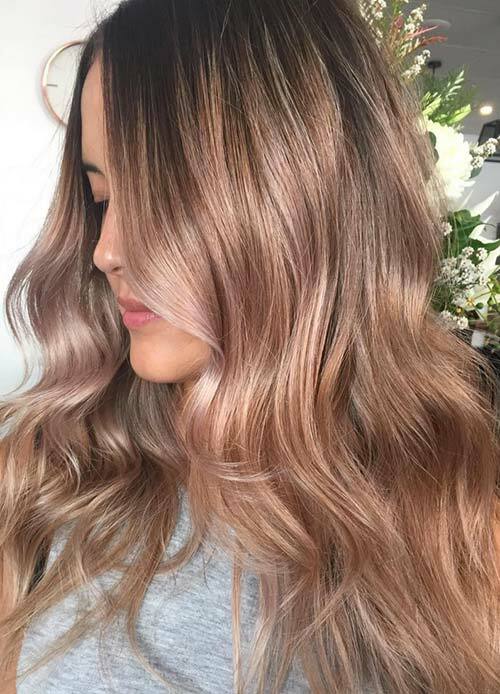 It’s time to start planning your autumn look and that means changing – or tweaking – your hair color to suit lower light levels. 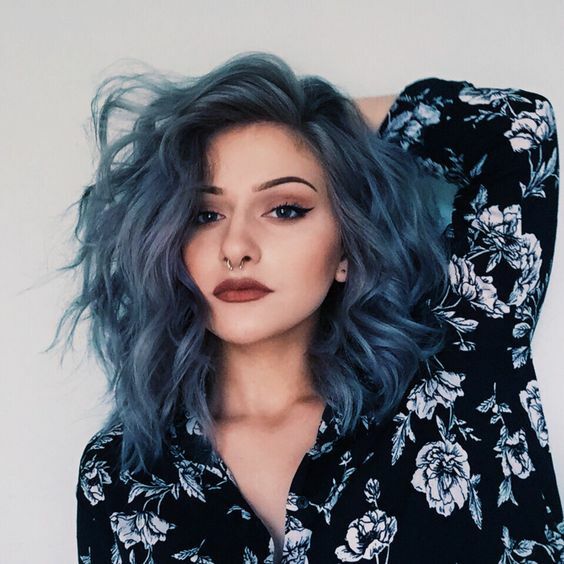 Different hair colors suit different seasons and not just because we all love change. Skin-tones change radically between summer-tan and winter-pale and bright, beach colors can seem harsh in other seasons. 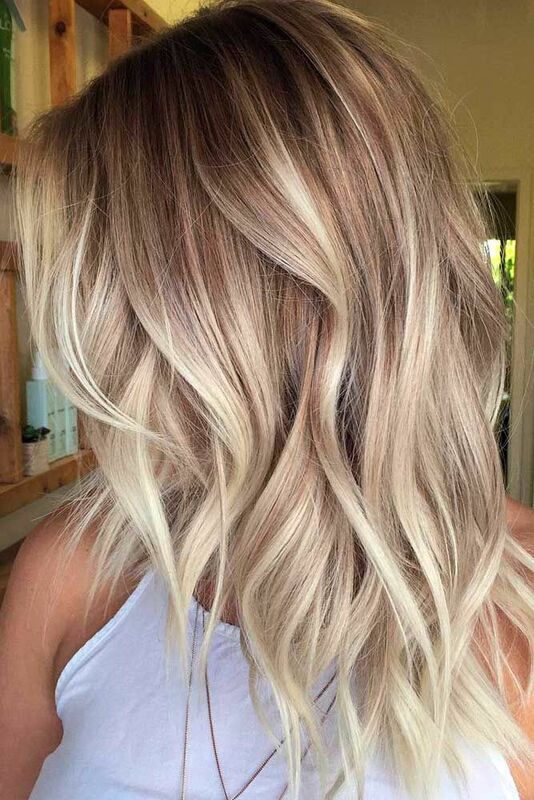 After summer sunshine, blonde often goes brassy and brunettes find the top is lighter than the rest! So take a look at what’s in fashion for autumn and fall in love with your new image! 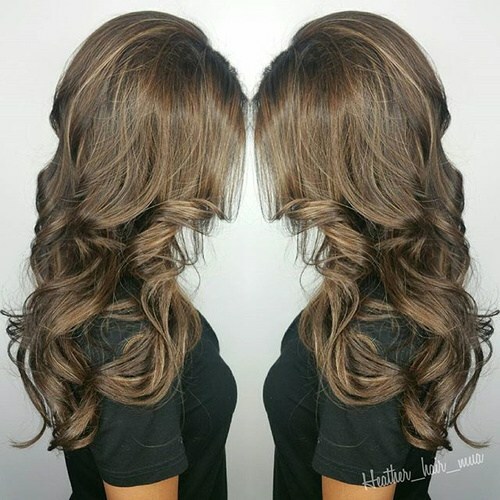 If your brunette locks are looking a bit the worse for wear, get a good trim and boost the color with a rich dark chocolate hair color. 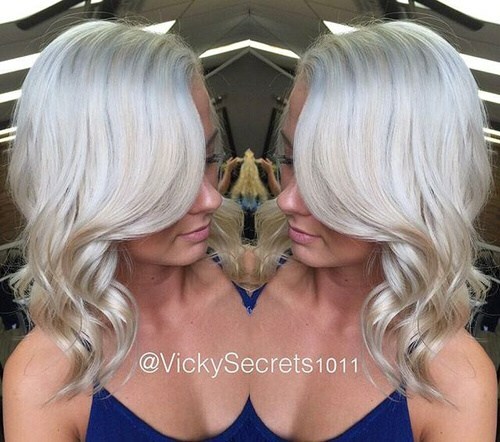 This healthy looking hair has natural looking tousled waves with just a tiny touch of blonde balayage near the tips. And there’s a trendy patch of dark espresso below the crown! 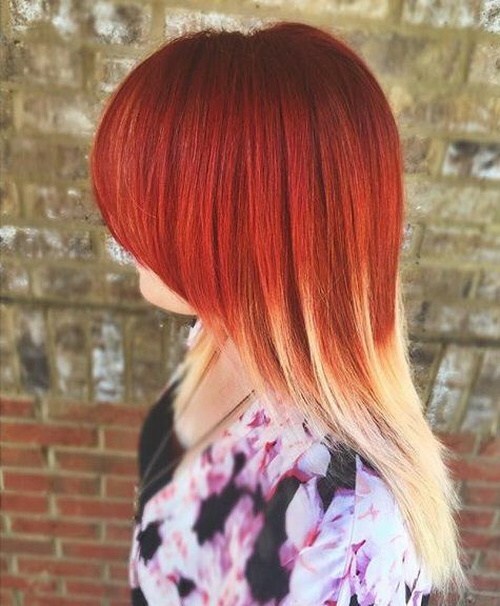 Flaming red and bright blonde are both eye-catching hair colors and sometimes it’s hard to decide which to choose! 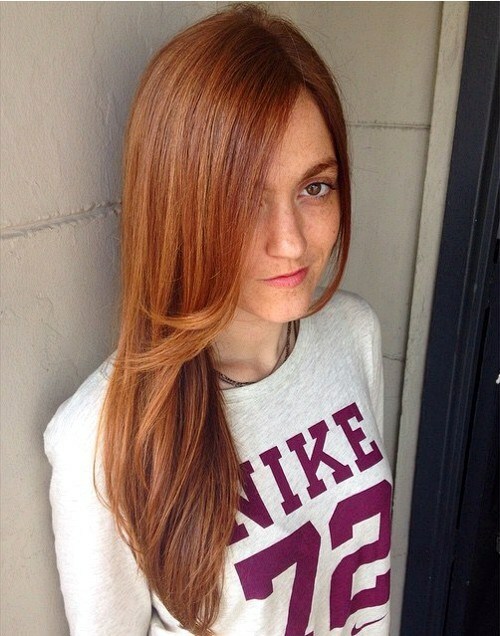 But you can have it all with this daring color combo of red hair changing to a blonde ombré. The smoothly styled top section has a little height at the crown and the lower lengths are heavily layered for a trendy, shaggy texture. Fabuloso! And continuing the color-fusion theme here’s another new idea! 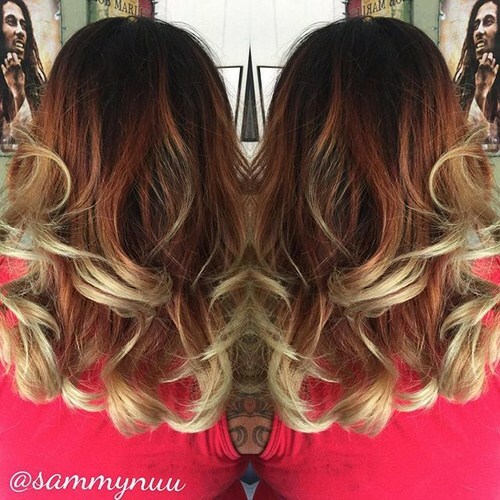 Brown roots with copper balayage on widely spaced long layers and medium beige-blonde ombré. 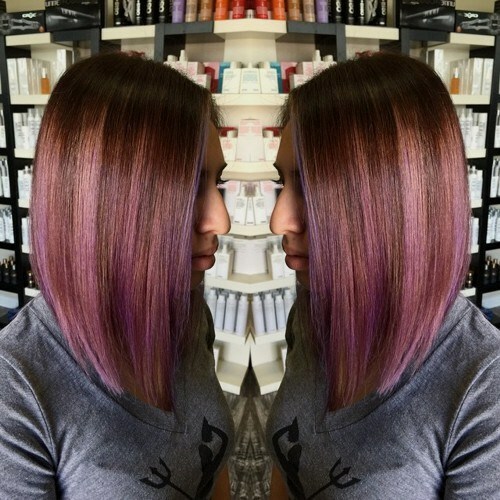 This creates a lot of 3-D color depth along with the natural, tousled waves making it a great style for medium to fine hair. Deep-plum lipstick with a pale skin-tone and this black and blonde color scheme is a strong look. 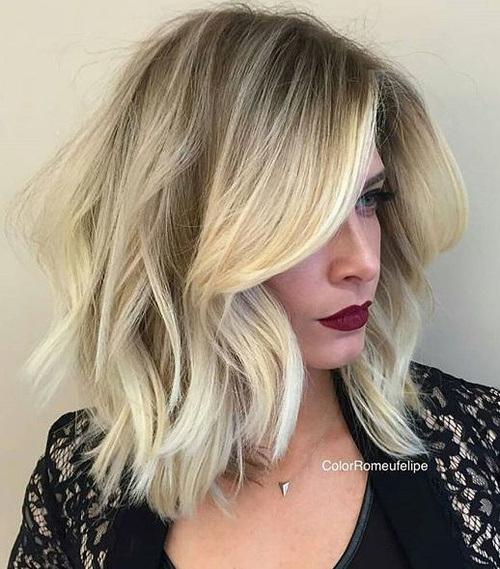 However, the border between the dark roots and the blonde hair is at least carefully blended to soften the contrast. Notice how the light blonde in the middle is lightened to highly fashionable white-blonde on the choppy, twisted ends. And here’s one of my favorite color blends – toffee and caramel with a touch of milk chocolate at the tips. Just like my favorite snack bar! The smooth top absolutely gleams with reflected light from the vertical highlighting and classic, glam waves add the finishing touch to a sophisticated design! 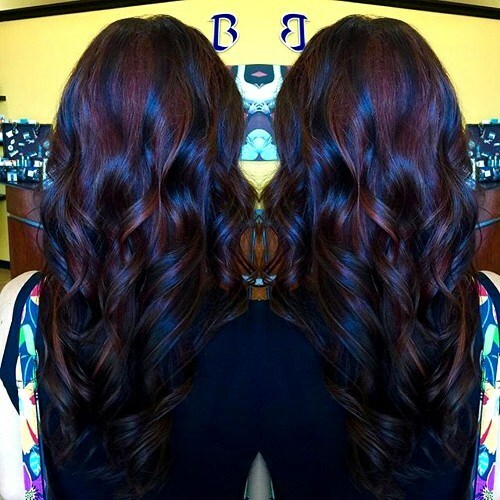 Black and brown hair colors are mingled in many new styles for autumn and this is one of our favorite looks. 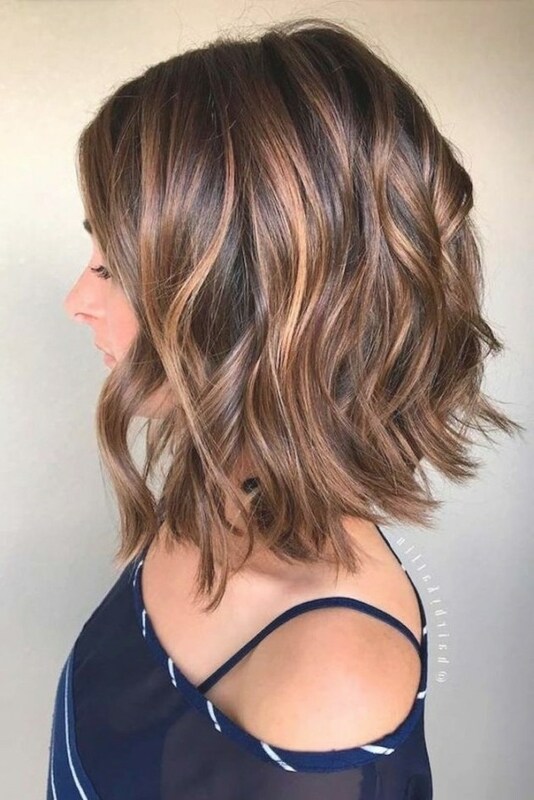 The brown ombré begins just above the shoulders and is subtly highlighted with copper-blonde enhancing the gorgeous, rippling waves in the soft V-shaped back. 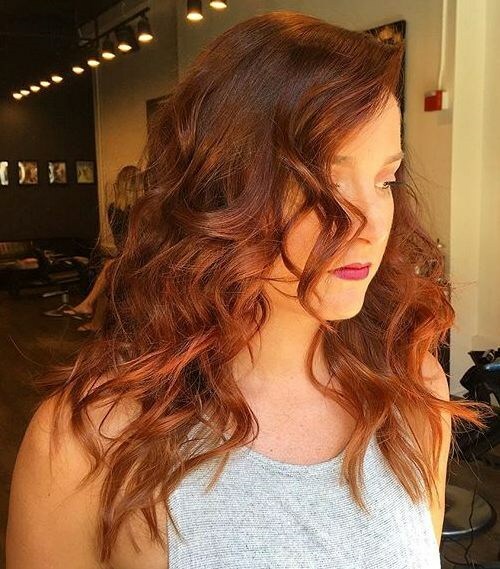 Rich, copper-colored hair is a thing of beauty, in my opinion, and doesn’t need any extra highlighting to look great! However, this casual, long straight style is given a subtle modern twist with a slightly darker ombré suitable for teens. And flipped-out volume at chin-length balances out a narrow face shape or chin in a relaxed way. After the casual and let’s admit it, untidy styles, we often wear in summer-time we all tend to smarten ourselves up in autumn! 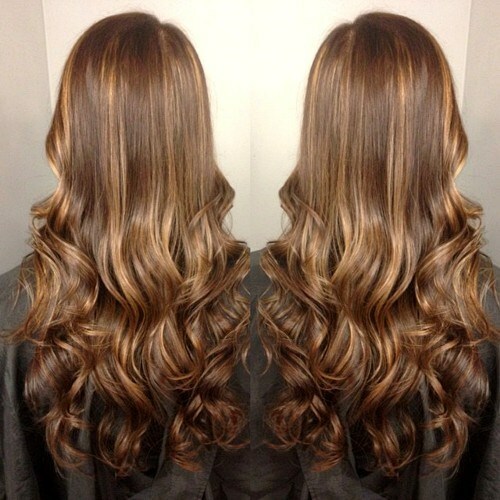 Here’s a carefully created long wavy look that’s perfect for a drinks party in the evening or a dinner-date. 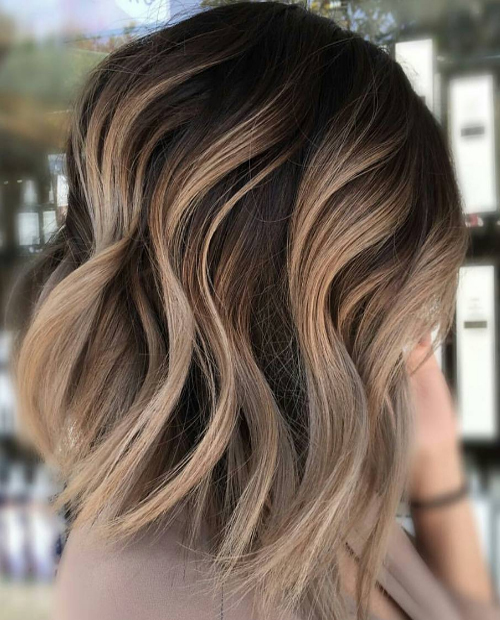 Shorter, curled-back layers around the face continue in a lovely graduated line of waves highlighted by fabulous dual-blonde balayage. 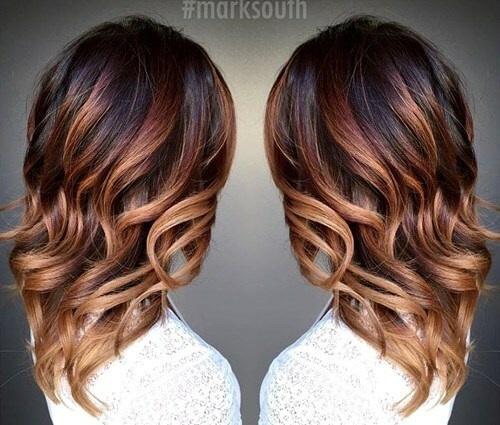 This is another new color placement idea that’s just starting to appear in the latest autumn hairstyles. The main section over the top and middle of the back is deep copper brown and all around is ‘border’ of brighter color. 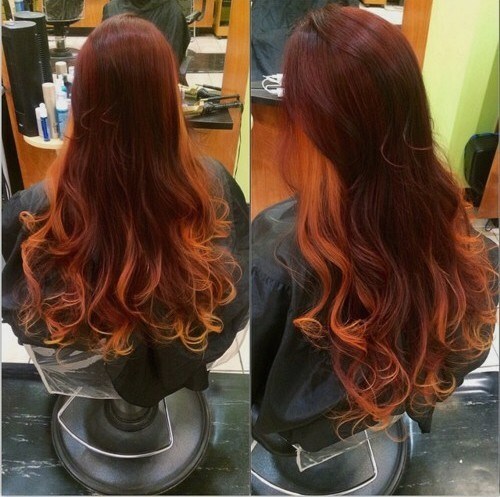 The border-color in this case is flaming copper and the clever stylist has also made the waves look like flames! 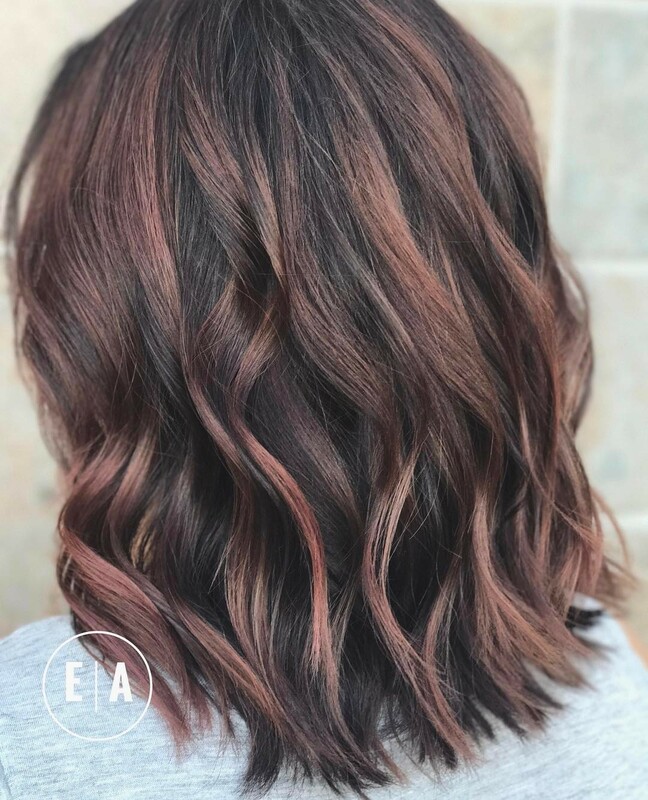 It’s important to choose an autumn hair color that matches your wardrobe and two of our favorite fall colors are navy-blue and maroon! Sooo . 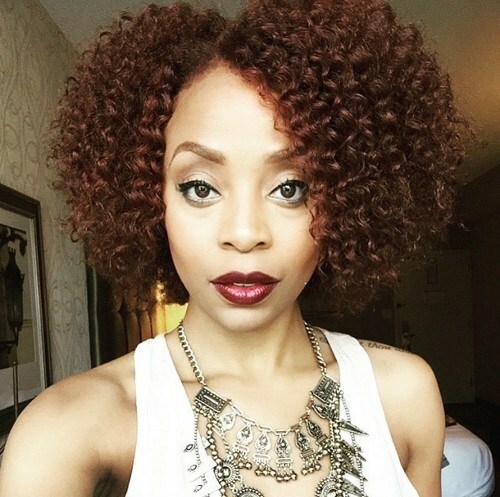 . . this imaginative colorist created the first deep-blue and maroon long, ringlet hairstyle! 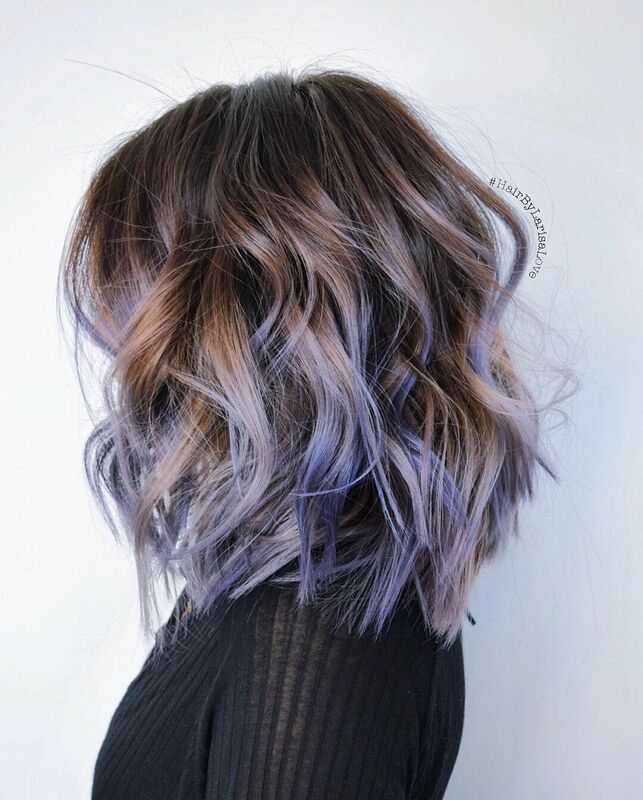 I think it’s an absolutely amazing new look and yet another beautiful breakthrough in hair color trends! 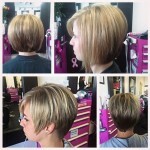 Fine hair always looks great in an elegant A-line long bob. Any longer and hair starts to look thin, but at this length you get the full beauty of soft, silky and shiny hair swishing around as you move! 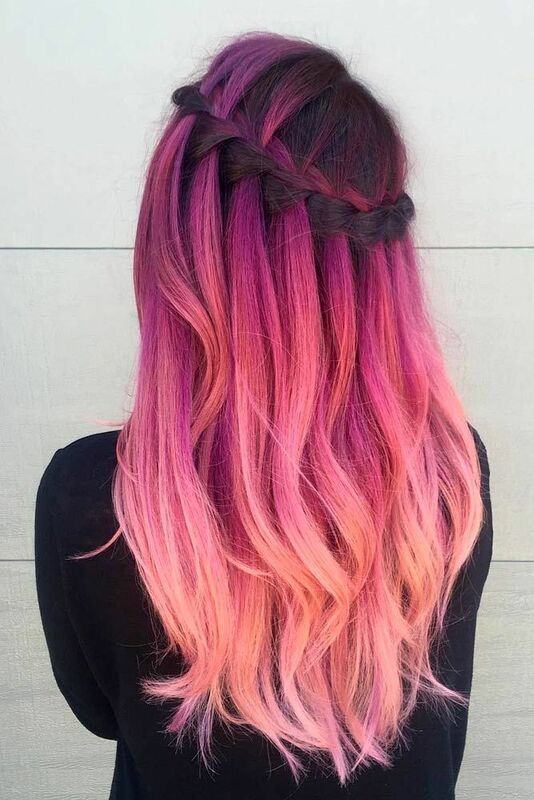 And to give your hair a fabulous new look for fall, why not add some imaginative color highlights like this lavender, pink and brown design? Sharing the color of fallen leaves in autumn, copper is always in fashion at this time of year. This long, casual hairstyle has a side-parting with extra volume on top from the asymmetrical, swept-across style. 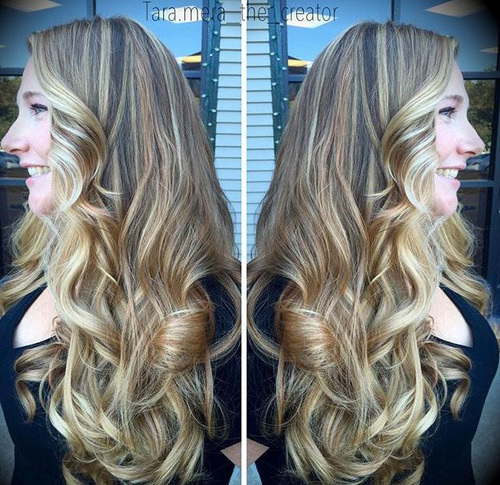 Shorter layers create flirty waves framing the face to accentuate eyes and lips! Now we’ve broken through the rainbow color taboo, there are some fantastic new ideas coming through! 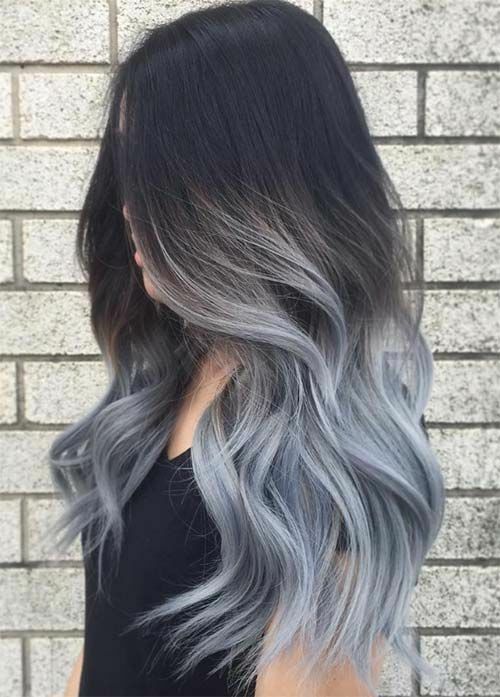 This glamorous white-blonde hairstyle with softly flowing layers has beige balayage, silver tips and pale blue-gray roots for a unique and sophisticated evening look! Add a modern touch to long straight hair with a subtle red-brown ombré and tousled waves for a natural look that’s suitable for any occasion. This attractive color design also has low-lights in espresso-brown to add a 3-D look that makes the lower lengths appear thicker. This spectacular coiffure bestows an air of casual, modern chic on the model – but a lot of effort has gone into creating this fab design! 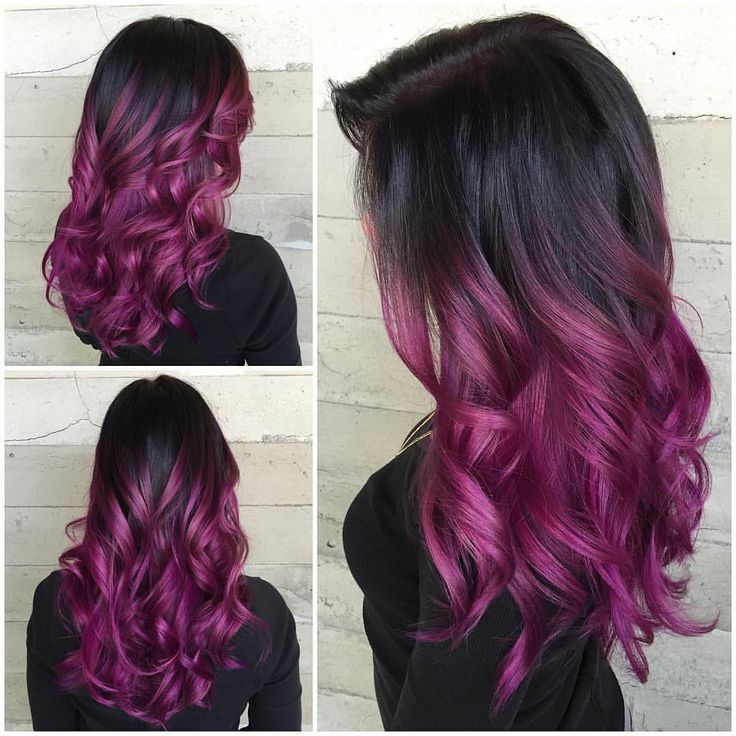 These colors suit women with medium – dark skin tones best and the roots are a rich, new aubergine (egg-plant) shade. 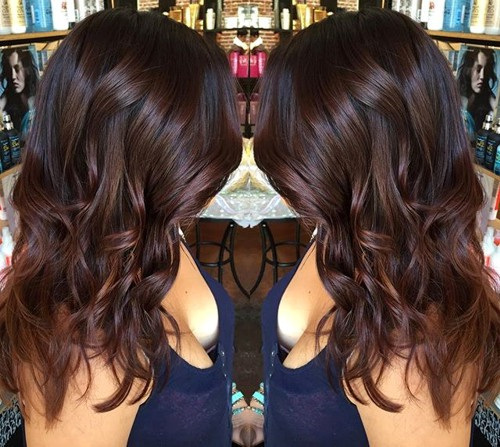 Toffee balayage shifts smoothly to caramel-honey ombré on fashionable defined waves. 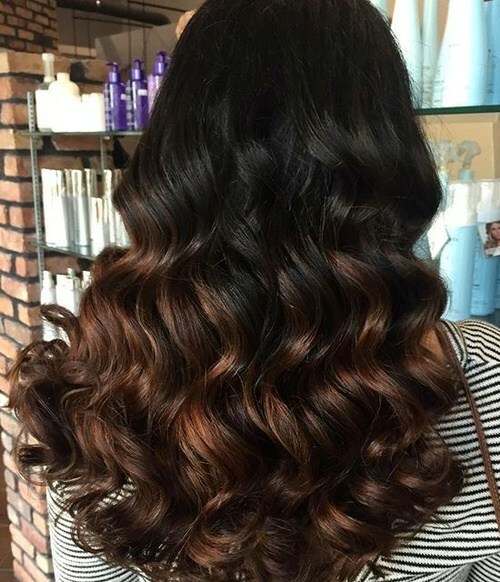 As someone with straight hair, I always envy the effortless volume you can achieve on naturally curly hair (sigh)! But whether your curls are natural or permed, this super hair design has fantastic shape and texture in the graduated layers. And this rippled style is perfect for adding ‘width’ to a thin or long face shape, too! 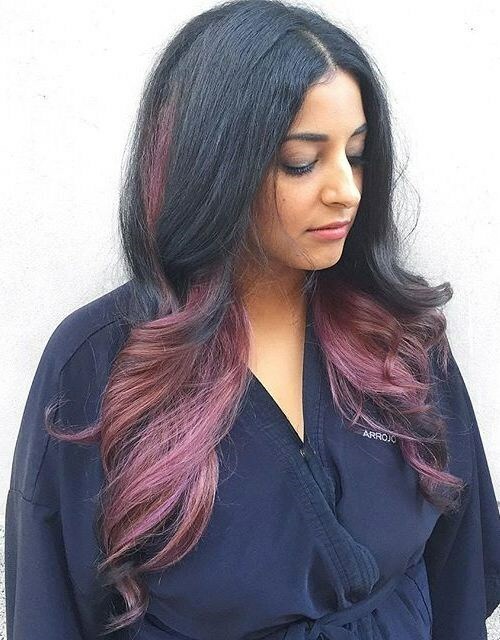 This sophisticated mulberry ombré adds a fabulous, contemporary look to long, thick black hair. Notice how well this muted shade looks against the model’s olive complexion and the bold streak of color at the side softens the black hair. I’m so pleased to see light-brown shades making a come-back. 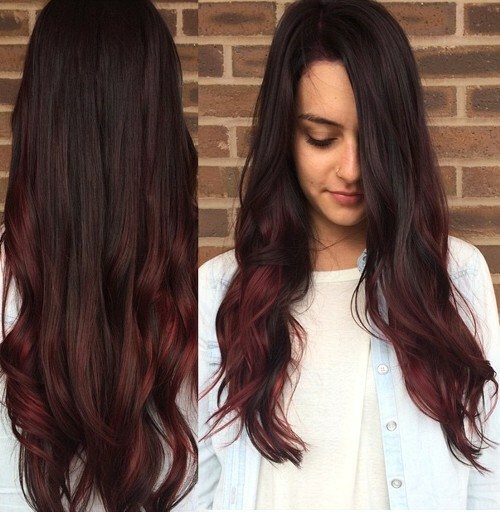 They can be the perfect natural-look color makeover for mousey-brown hair, without going blonde. Staying within the same color tones means the result will match your skin-tone and be gentler on your hair – and wallet! 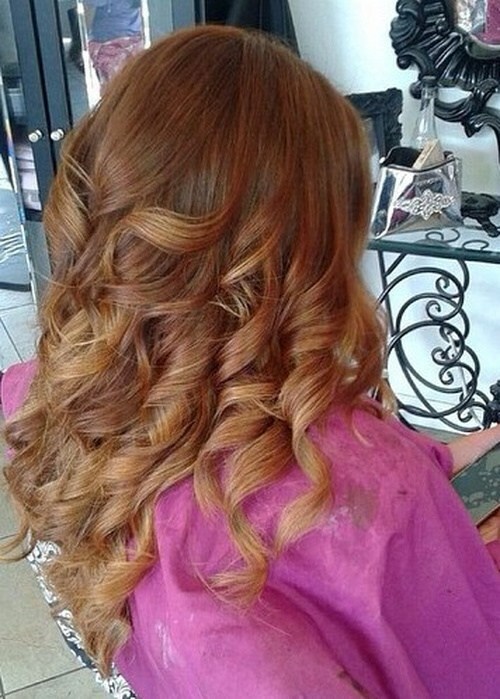 This lovely ringlet hairstyle is a super choice for a special evening date. The hair is slightly darker on top and fades to an ombré that’s just a couple of tones lighter, keeping the look soft and natural. These romantic, cascading curls complete an enchanting, semi-formal style! So don’t feel sad that the crazy days of summer are coming to a close! 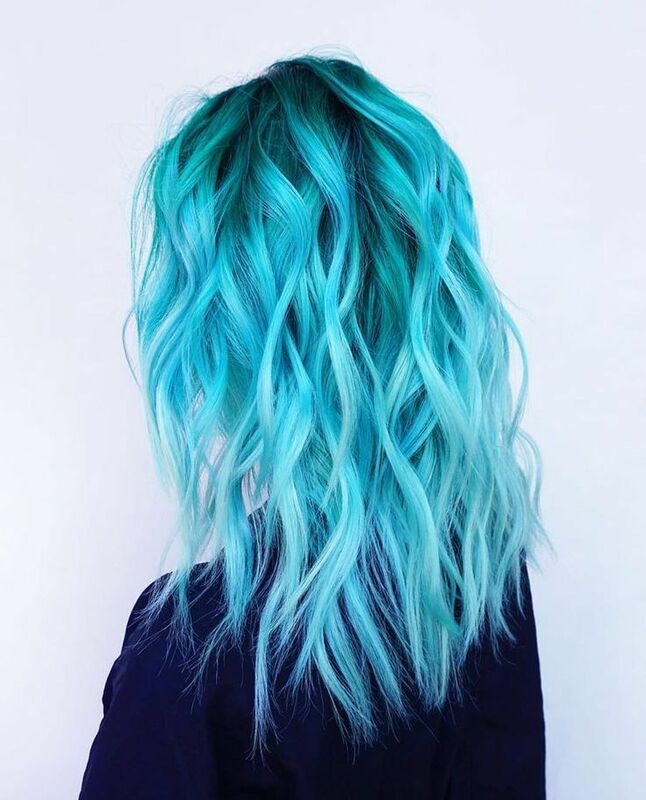 We’ve got the new autumn fashions, loads of exciting breakthrough hair colors and oceans of cascading waves to boost our beauty score to the max this fall!